As we approach our 30th Reunion Celebrations, it is important to look back over the past years, at all of the people who have come and gone from our organization. Choir is ultimately about people, and how those people come together for a time and form a community. 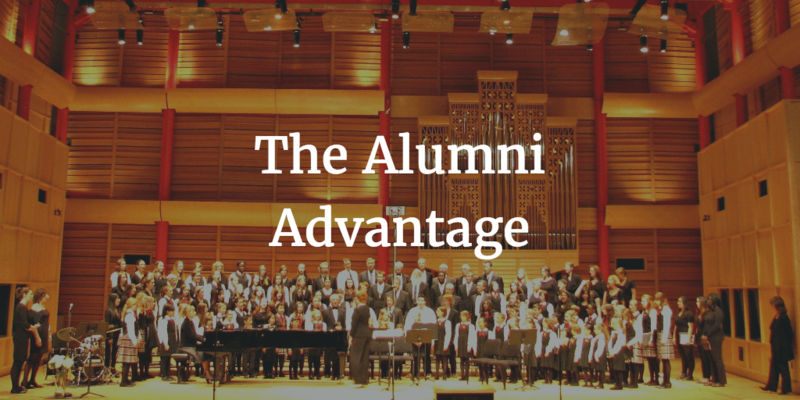 The ‘alumni advantage’ then is the lasting benefit we receive from the ever-connected web of people who have been directly, and indirectly impacted by their time with the Calgary Children’s Choir. This is an on-going, mutually beneficial relationship. The current choir members can benefit from the mentorship, and relationship with alumni who come back; to teach, to perform as soloists, or collaborate as guest musicians, and those who support the choir in other ways. The alumni benefit from always having a welcoming place to come back to, and a comfortable group with whom they can share their talents, and who will always support them. Re-connecting with alumni is rewarding, and inspiring – we get to see what our choristers have been up to since they’ve left our organization, and see how they’ve changed, and how they’ve stayed true to themselves. We are so grateful that every five years, our alumni come back home, to help us celebrate another milestone in the CCC legacy! How else do alumni benefit our organization? Tell us in the comments!